26 watts of power used for 110 watts of light output. 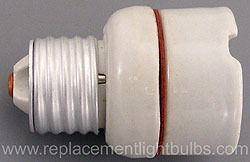 Maximum Overall Diameter: MOD 2.38"
Replaces ten 1,000 hour regular 110W light bulbs. Daylight balanced for photography and commonly used for small product photography.